Major Sumner performs a ritual dance to celebrate that a box containing the skull of an indigenous Australian human is to be returned to Australia from Liverpool Museum. Striped body painting adopted by indigenous populations may provide protection against horseflies, research suggests. Scientists already knew that the black and white stripes of zebras deterred the vicious blood-sucking insects. Now a new study seems to show that contrasting stripes painted onto human bodies have the same effect. Many indigenous tribes in Africa, Australia and Papua New Guinea have traditionally daubed their faces and bodies with white, yellow, grey or beige stripes made from clay, chalk, or plant and animal products. The majority also live in places where horseflies, both unpleasant and disease-spreading, are abundant. To test the body painting theory, scientists in Hungary devised a bizarre experiment involving life-size plastic mannequin “models” covered in sticky mouse-trap glue. Models coloured brown or beige to mimic dark and fair skins were left either standing or lying in a horsefly-infested meadow near Szokolya, Hungary. 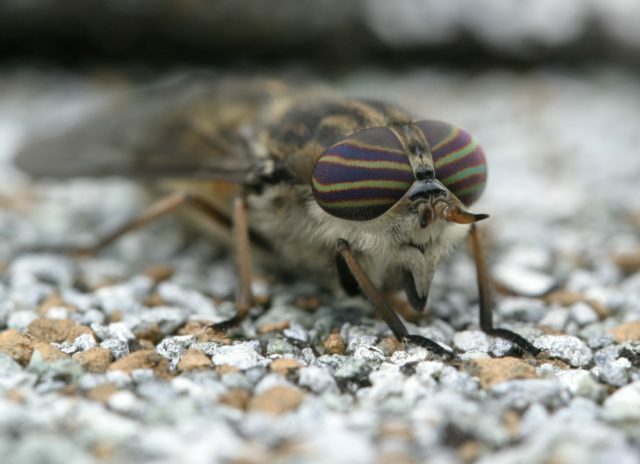 The study found that a uniformally brown model was 10 times more attractive to horseflies than a white-striped version. Horsefly attractiveness was measured by counting the number of insects trapped in the surface glue. The beige mannequin drew twice as many horseflies as the striped brown model, said the researchers writing in the journal Royal Society Open Science. The team led by Dr Gabor Horvath, from Eotvos University, concluded: “The results of our field experiment support the theory that the use of striped body painting may be related to protection against dangerous parasitic pests. Models in the lying posture reflected polarised light, which is known to attract both water-seeking male and female horseflies, said the scientists. The standing mannequins imitated dark objects which were known to attract female horseflies looking for a blood meal. When the sticky models were standing, they only trapped females. Both males and females were trapped when the models were lying face down or on their backs. Body stripes are chiefly used by indigenous people as decoration, for emotional expression, or as markers of personal identity or group affiliation, said the scientists.